The exhibition will then travel, in a condensed form but with additional works, to the Los Angeles County Museum of Art from 11 November 2012 to 10 February 2013 and to the Wadsworth Atheneum Museum of Art in Hartford, Connecticut from 8 March to 16 June 2013. With the sole exception, almost forty years ago now, of the exhibition organized by Jean-Pierre Cuzin and Arnauld Brejon de Lavergnée , which in fact included only French artists (or, some thought to be so at the time), there has not been a show in France devoted to the general subject of Caravaggism. And yet, since that time, Caravaggio has increasingly taken on "star" status in the world of art history, one of the very few artists to draw crowds at the mere mention of his name. But in 1983, when the Grand Palais staged a retrospective on Neopolitan painting  which featured one of the painter’s greatest masterpieces, The Seven Deeds of Mercy, public awareness had not yet peaked and attendance remained absolutely normal. 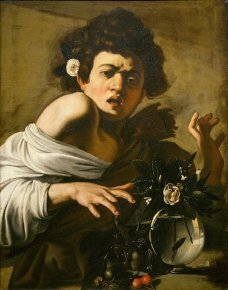 This passion for Caravaggio today has its unwelcome consequences : hasty attributions to the point of being ridiculously unfounded often due to the zeal of the popular media  as well as the over exposure of the artist’s works, at times with dubious scholarly arguments. There are only about sixty acknowledged works known today, and each of them is aggressively sought after for exhibitions. Some of these often fragile works thus spend their time traveling between continents, undergoing the danger of being progressively damaged. 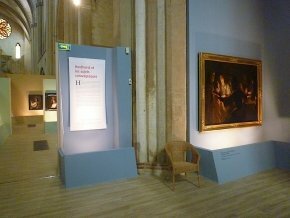 We should note however that the nine Caravaggios presented in Montpellier (ill. 1) have not, as is the case for others, been featured in too many exhibitions recently. And at least, this time, they will have traveled for a good reason since there is no doubt that this double exhibition corresponds to the high standards one should expect. Some Parisians must be jealous indeed at the idea of seeing so many masterpieces brought together with no stop planned in the French capital. This exhibition whose objective is to show Caravaggism as it appeared in Europe during the first thirty years of the 17th century  and takes stock of the latest discoveries is thus a resounding success. The two museums have shared the task equally by choosing to divide the show according to nationality. This is a debatable choice as the painters lived together for the most part, but it is of course quite pragmatic. In an aside, the fluctuating character of the criteria for organizing the schools by country makes for amusing fare : just a few years ago, the young Ribera’s paintings, still anonymous and assembled under the name of the Master of Solomon’s Judgement, were thought to be French ; Death Comes to the Table, today attributed to the Florentine Giovanni Martinelli (missing in the exhibition here  was also considered French  ; Cecco del Caravaggio was also thought to be French when in fact this is an Italian artist by the name of Francesco Boneri...These changes illustrate in fact just how French art historians, though unconsciously, sometimes exaggerate their country’s role in their field . 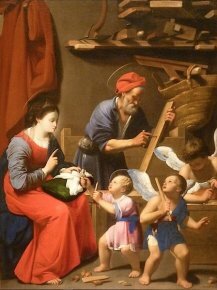 In any case, we should remark that the exhibition presents The Holy Family in Saint Joseph’s Workshop from Hartford as being by Carlo Saraceni (ill. 2), and not by Guy Francois, a very unusual assertion in a French publication . 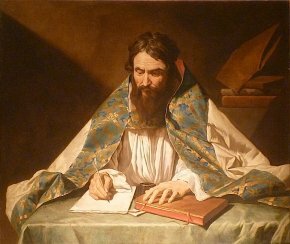 Will we perhaps realize one day, contrary to current belief, that the Pensionante del Saraceni, whose beautiful Saint Peter’s Denial from Douai is on view here, was not from France ? 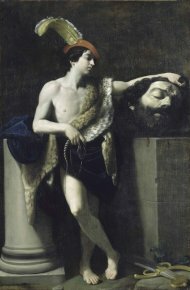 Regardless, we should point out here the remarkable essay by Gianni Papi which attempts to summarize recent discoveries about Caravaggism, many of which are his, notably the re-creation of the young Ribera. Thus, in Toulouse, visitors will see Northern Europeans (ill. 3) and in Montpellier, the Italians, French and Spanish (ill. 4). But we would advise museum goers to travel to both cities as the exhibition is made up of two shows. Before starting our visit in each of the museums, we would like to touch upon the organizers’ choice of presentation. They decided to draw mainly from the collections owned by FRAME (see article in French), as the exhibition was sponsored by this institution. This did not prevent them from looking in other leading museums for certain essential works, perhaps a bit too shyly for our taste. As a result, they were left without some artists which are missing in the demonstration here. 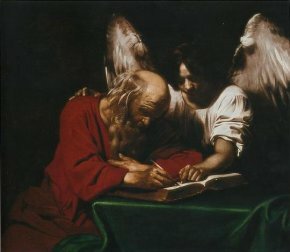 Among the painters who worked in Caravaggio’s immediate circle and were strongly influenced by his example before he died prematurely, there are on the one hand - in a roll call established by Mancini, as Gianni Papi reminds us - Bartolommeo Manfredi, Jusepe de Ribera, Cecco del Caravaggio and Spadarino ; and on the other, Orazio Gentileschi, Carlo Saraceni, Orazio Borgianni and Bartolommeo Manfredi (the only one who appears in both lists) if we accept Judith W. Mann’s conclusions. We find it hard to understand why both these scholars restrict themselves to only four out of these seven artists who are all essential for the beginning of Caravaggism. Of these seven painters then, we see that two of them (Cecco and Spadarino) are not present in the exhibition. In the same way, we regret that there are no works by Antiveduto Gramatica (who Judith W. Mann tells us may also have personally known Caravaggio) on view. This oversight (in fact only relatively so since they are studied in the catalogue) makes for a strange parallel with the presence of artists who do not really have much to do with the movement. While the names of Guido Reni (ill. 5) or Baglione, to mention only two, can be seen as perfectly justified with paintings which are frankly Caravaggesque although they themselves were not, we do not see what Guercino, Michiel Sweerts, Leonaert Bramer or even Zurbarán and Velázquez have which is Caravaggesque. As for Rembrandt, the exhibition Rembrandt-Caravaggio (see article in French) in Amsterdam a few years ago was sufficiently clear in demonstrating that these two painters have absolutely nothing in common. 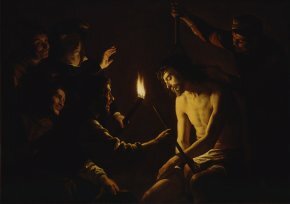 Realism, even with luminist effects, is not a synonym for Caravaggism. If we wish to know what Caravaggism is (using a pedagogical approach for the use of the public), we need to have a stricter definition or else the concept will simply be devoid of any sense. 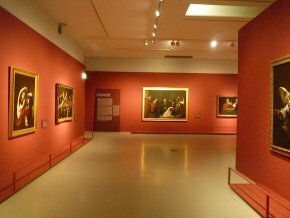 The first section in Toulouse, entitled The Caravaggio generation in the North : attraction and resistance thus deliberately begins with a few paintings which are (more or) less Caravaggesque. 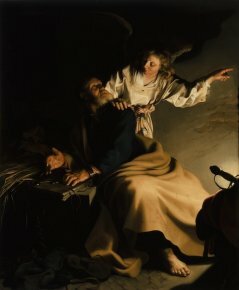 There is a very beautiful The Liberation of Saint Peter (ill. 6), perfectly in tune with the subject, belonging to the Cincinnati Art Museum which is still anonymous. Caravaggism, without even including the many other groups of works under conventional headings, is one of the movements in art history (since the Renaissance) where we find the largest number of anonymous masterpieces. The organizers were thus right in presenting several of these, such as the one here, still enclosing so many secrets after all this time. 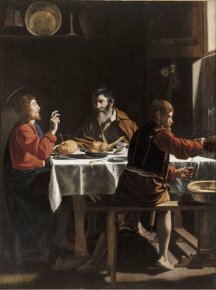 In Toulouse, we would also like to point out a Flemish or Dutch Scene from a Meal at Emmaüs (Columbus Museum of Art) and in Montpellier, the superb Supper at Emmaüs from Nantes (ill. 7), attributed to an anonymous (perhaps French) artist, "one of the most irksome enigmas of Caravaggesque painting" according to Axel Hémery. We should also note that the magnificent Herodias Holding the Head of Saint John the Baptist from Montpellier, often attributed to Claude Mellan these last few years, now returns, and aptly so in our opinion, to a cautious anonymous status . 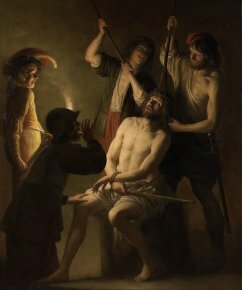 The first half of the visit in Toulouse  is devoted to the Utrecht school with several masterpieces by ter Brugghen (The Mocking of Christ from the Musée de l’Assistance Publique ), Honthorst and Baburen. This last painter (and the most unfamiliar in France, since the Louvre does not have any of his works, alas), is represented with A Pipe Smoker from the Musée Marmottan (which is not exhibited to the public there) and the remarkable Crowning of Thorns residing in Kansas City (ill. 8). As for Honthorst, his most moving work here is of course The Mocking of Christ (ill. 9) from Los Angeles. After the following section, where visitors can see Rembrandt’s Flight into Egypt from the Musée des Beaux-Arts in Tours and, especially, the magnificent Scene of a Suicide from Lille (another anonymous work), we linger a bit longer before the short monograph featuring Matthias Stomer. This room is one of the many highlights of these exhibitions. The artist  is indeed often underestimated perhaps because he is relatively abundant and often appears on the art market. The wealth in French museums made it possible to assemble a group of very high quality works attesting to the fact that this is a first rate artist, a contradiction to Benedict Nicolson’s assertion  that an important exhibition featuring would be disastrous. On the contrary, we see here the refined colors, visible notably in the cloth covering of the Saint Ambrosius from the Musée des Beaux-Art in Rennes (ill. 10) or in the costumes of the Magi and the pages in the Adoration of the Magi from Toulouse (ill. 11). Also of note is The Sacrifice of Isaac pointed out in a 1993 publication about the Musée Fesch but which remained unknown among the literature on the artist. 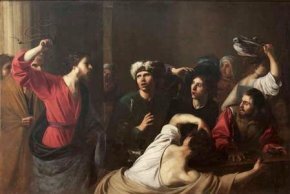 One of the rooms in Toulouse studies the curious notion of "Caravaggesque drawing", particularly strange since all of the works presented here scrupulously exclude any sheets by an artist from this movement, except for ter Brugghen. We were not necessarily convinced by this section which claims to see a Caravaggesque manner in the drawings of artists such as Bloemart, Bramer, Jordaens and Lievens. 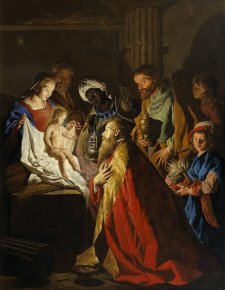 However, a sheet by Honthorst, not exhibited, published in the catalogue and held in Liepzig, corresponds insofar as possible to the idea one might have of a "Caravaggesque drawing". 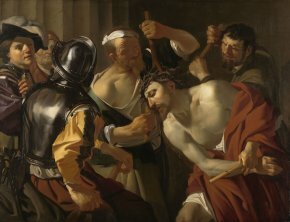 The exhibition concludes with the Flemish Caravaggesques, presenting some magnificent canvases such as Jan Janssens’ Crowning of Thorns (ill. 12) and the Deploration of Christ by Pieter van Mol (Abbeville). 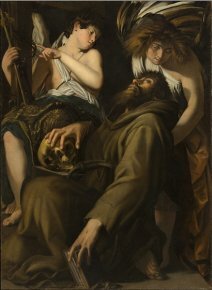 Another very beautiful anonymous work, the Saint Jerome from Caen, formerly attributed to Wolffort but withdrawn after a comparison with an acknowledged painting of his, closes this section where visitors will also enjoy two works by Michiel Weerts which are nevertheless in our opinion unrelated to the subject here. 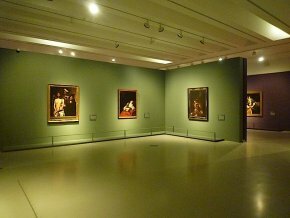 The Musée Fabre of course has the incomparable advantage of presenting the Caravaggio paintings. These are not, as we said earlier, the ones most often seen in public (even if it is a bit exaggerated to say, for the Flagellation from Rouen -ill. 13, that it has "been shown very little", given that it is on view permanently at the Musée des Beaux-Arts ). Visitors will appreciate notably the Francis of Assissi in Ecstasy (ill. 14) residing at the Wadsworth Atheneum Museum in Hartford, less than 200 km. north of New York City, which is particularly rich and has lent generously to this exhibition. In the same way, the Young Boy Bitten by a Lizard (ill. 15) from the Fondation Longhi is not as well known as the version at the National Gallery in London, which sent Salome Receiving the Head of Saint John the Baptist. Although Caravaggio was a genius, some of his followers came close to attaining the same level of skill. 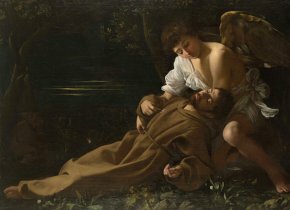 Thus, Giovanni Baglione, who was his sworn enemy while at the same time adopting his manner in a few works, produced a masterpiece with the same subject in The Ecstasy of Saint Francis (ill. 16) acquired in 2002 by the Los Angeles County Museum of Art, one of two known versions of this composition. This is perhaps Caravaggio’s greatest achievement : eliciting a legacy of paintings which, though showing common characteristics among themselves and with his own, often create original compositions. 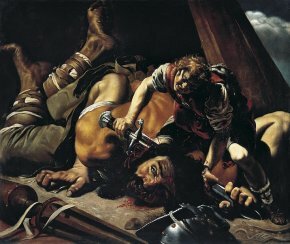 It is the case of Orazio Borgianni who treats the theme of Goliath’s beheading by David (ill. 17) in an extremely new and surprising way, as well as Orazio Gentileschi (Prado) who repeats the subject of Saint Francis abandoning himself in the arms of an angel but completely renews the composition (in fact closer to Baglione than to Caravaggio here). Carlo Saraceni’s refined elegance, Serdino’s rugged realism : there is not one Caravaggism but several, beginning with the one derived from Bartalommeo Manfredi, known as Manfrediana Methodus, a term coined by Sandrardt which is still very useful in classifying artists though it needs qualifying, notably with the reattribution to Ribera (and the ensuing chronological change) of the "Manfredian" works of the Master of the Judgement of Solomon. The most obvious followers of the Manfrediana Methodus (in fact simply a distinction for a handful of Caravaggio’s own works such as the Card Players in Fort Worth or the two Fortune Teller from the Louvre and the Museo Capitolino in Rome), are the French artists Valentin, Tournier, the Roman Vouet and Nicolas Régnier (if we accept him as a French painter of course). Several beautiful examples are shown here, notably the very moving Saint Matthew and the Angel (ill. 18), extremely influenced by Caravaggio’s first painting for the altar of the Contarelli chapel, anonymous until now and presented for the first time as being by Régnier after the brilliant attribution by Annick Régnier. As for Manfredi, besides David’s Triumph astutely acquired by the Louvre in 1990, visitors will enjoy seeing Jesus Chasing the Merchants from the Temple held at Libourne (ill. 19), discovered and attributed by Michel Laclotte, which is still an impressive painting despite its poor condition. We will not linger in the section entitled The Caravaggesque Temptation presenting some works which we feel are far removed from Caravaggism except to point out the presentation of a masterpiece by Lionello Spada brilliantly acquired by Michel Hilaire from the Canesso gallery and on view to the public for the first time. This painting, and there is no shadow of a doubt in this case, does indeed reflect the "Caravaggesque temptation" although it cannot be classified absolutely in this movement, as is the case for example of the works by Asserreto and Strozzi, artists from Genoa. The exhibition ends on the upper floor with Naples and Spain, concluding with a section entirely devoted to Georges de la Tour. On the subject of Spanish Caravaggism and their very close ties to Naples, we would refer our readers to the catalogue essay where Guillaume Kientz presents his study. He reproduces a particularly impressive painting by an unfamiliar artist called Clemente Sánchez (not exhibited). Is this a Caravaggesque work or not ? Once again, the answer is not really obvious . This final section presents a remarkable Jacob and Rachel’s Wedding a Louvre deposit at the Musée Granet in Aix-en-Provence. The Parisian museum would do well to recover this painting which has no business being in a city which sends such masterpieces into storage rather than showing them to the public (see article in French). What can be said about Georges de La Tour’s Caravaggism ? Or, a related question, that of his supposed trip to Italy ? The exhibition does not elude the issue although it cannot provide a definitive answer. However, one thing is certain. 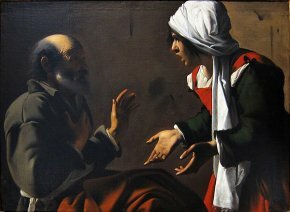 Though different, even very original, de La Tour was indeed influenced if not by Caravaggio himself, at least by Caravaggism. As Pauline Choné suggests in her essay, we can be pretty sure that he at least traveled to northern Italy where Merisi was trained and discovered the local tradition which had already invented a certain form of luminism. But we have a hard time believing that he never saw, in some way, the paintings of Northern European Caravaggesques. The presence in Nancy of Caravaggio’s Annunciation alone is not enough to explain de La Tour’s art. As we can see, despite the fact that the subject has been treated repeatedly over the past few years, questions, theories and doubts still abound on a great number of points. This exhibition represents a further step in advancing research in a field which is far from being elucidated yet. 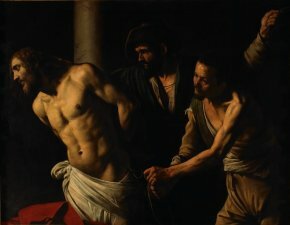 The mysteries surrounding Caravaggio, which often make the headlines in the media worldwide, go far beyond just his art. Curators : Michel Hilaire and Olivier Zeder (Montpellier), Axel Hémery (Toulouse). Collective work, Corps et ombres : Caravage et le caravagisme en Europe, 2012, 5 continents editions, 504 p., 39€. ISBN : 9788874395699. Visitor information : Musée Fabre, 13 Rue Montpellieret, 34000 Montpellier. Tel : +33 (0)4 67 66 13 46. Open every day except Monday from 10 am to 8 pm. The exhibition will also be open exceptionally on Monday from 10 am to 8 pm starting in September. Admission : 9€ (reduced : 7€). Musée des Augustins, 21 rue de Metz, 31000 Toulouse. Tel : +33 (0)5 61 22 21 82. Open every day from 10 am to 7 pm, until 9 pm on Wednesday. Admission : 9€ (reduced : 5€). We would also like to point out the publication of a work by Olivier Bonfait, Après Caravage. Une peinture caravagesque ? (2012, Hazan, 222 p., 19€. ISBN : 9782754106306) which we will soon cover in another article. Valentin et les caravagesques français, Paris, Grand Palais, 1974. La peinture napolitaine de Caravage a Giordano, Paris, Grand Palais, 1983. And even up to the middle of the century if one takes into account Georges de La Tour. However, one of the versions was shown in Ajaccio last year. See the exhibition La peinture francaise dans les collections americaines, Paris, Grand Palais, 1982. This is especially true in the case of French artists having spent their entire career abroad (Gaspard Dughet, for example, who never set foot in this country and who is not even known to have spoken the language) but, paradoxically, appropriating the names of foreigners who worked in France (Philippe de Champaigne, who was born and trained in Brussels...). In the same way, the Saint Cecilia and the Angel from the Galleria Barberini in Rome is systematically presented as being by Saraceni by the Italians and as a work by Guy Francois by the French... For visitors interested in knowing more, they should walk over to the church of Notre-Dame-des-Tables in Montpellier, just behind the museum, which holds a canvas by Guy Francois in its right transept, Christ on the Cross between the Virgin, Saint John, Saint Ignatius and Saint Francis Xavier. Jean-Pierre Cuzin had created at the time a Master of the Montpellier Herodias. We should note that the author of this entry, Benjamin Couilleaux, presents a very convincing comparison with the Woman Playing a Guitar (Rome, Patrizi collection) as well as another possibility, but less convincing, with the Head of a Young Girl from a private collection in London. We point out the quality of the lighting here despite the complicated exhibition conditions in this space (the chapel choir), not really adapted for this type of event. This museum is now closed as the Hôtel de Miramion was sold by the APHP. We will soon discuss this affair and the quick transfer promised by the Hôtel-Dieu in Paris. We do not really understand the purpose of changing his name from Stomer to Stom. Although both forms appear in archives, Stomer is the one most frequently used in the last few years. See p. 310 in the catalogue. It is true that it has not been shown at a temporary exhibition since 1989. We should also point out that we had been told some time ago that it would never travel again...Let us hope that once it returns to its museum, it will not be inside the special climate-control installation designed specifically for this occasion as it partially obstructs viewing the work. And the reason for which the author remains cautious, as he does also for Velázquez and Zurbarán in fact.